Our main lodge building is a charming blend of modern features and traditional architectural design. Surrounded by pristine forests, the westward facing balconies offer a stunning sunset over the neighboring 'Khao Ito' mountain. A picture perfect end to a busy day. 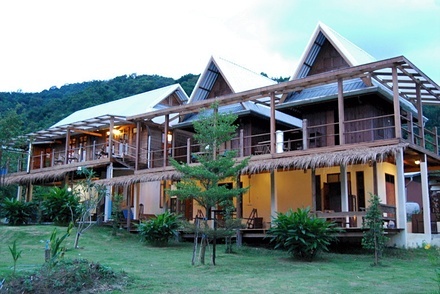 The main lodge building ecompasses two traditional Thai stilted houses. All wood has been reclaimed and some of the teak panels in the Siam house are thought to be at least 100 years old. Each of these rooms has its own bathroom on the lower floor which can be accessed via the private garden below.